The main trouble with foreign investment is that all the investment is foreign. Or something along those lines. 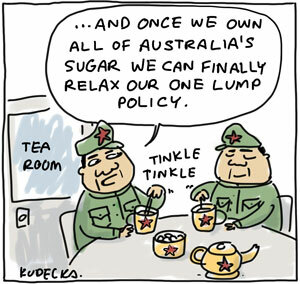 Anyway it seems that China is buying all our sugar for their own nefarious ends. Or they might just think there’s a quid in it, what with all of us massive Westerners guzzling the stuff all day long. Now I’m not a climate economics broker scientist, so long as there’s a sachet of sugar on the cafe table to sprinkle into my latte I’m probably okay with it. The CPR still remains a technocratic communist country, where the rights to private ownership are conditional and limited. Individual freedom largely proscribed. If the Chinese investment was say foreign PRIVATE ownership, I’d say fair go, but this is akin to the Australian Defense Force setting up a recruitment centre in Tienanmen square seeking strategic Australian enlistments? Aaagh! Red sugar under the beds! … that goes scrunch! scrunch!! scrunch!!! as we so softly tip toe past!